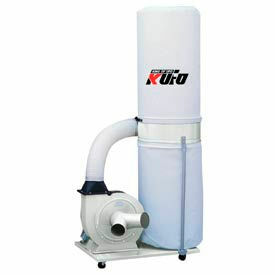 Kufo Seco Dust Collectors Are Designed For Use In Industrial Production Lines. Dust collectors ensure equipment runs continuously and reliably without interruptions during operating hours. Totally enclosed fan cooled motor is used for dirty, dusty and even outdoor applications. Made using heavy, one-piece 15 gauge steel housing with industrial-grade rustproof paint finish. Quick install collection bags make emptying and re-attaching easy. Replacement Canister Filters are available for dust collectors. Kufo Seco Wall Mount Dust Collector Is Designed For Convenient Storage And Use In Industrial Production Lines. 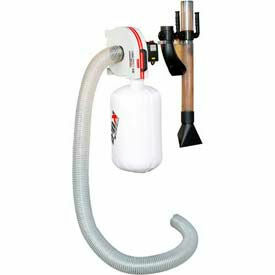 Wall mount dust collector uses its powerful motor to extract dust created by various machines. Ensure equipment runs continuously and reliably without interruptions during operating hours. Totally enclosed fan cooled motor is used for dirty, dusty and even outdoor applications. Made using heavy, one-piece 15 gauge steel housing with industrial-grade rustproof paint finish. Dust collector features 1HP, 110V motor which provides up to 650 CFM using a 10" diameter impeller. 2 Cubic Foot bag capacity. Bag measures 21" diameter x 22"D.
Optional Accessories Package available which includes 2 floor nozzles, 36" extension tube, 4" blast gate, two spring clips for wall mount storage and 4" dia. x 10 ft. flex hose. 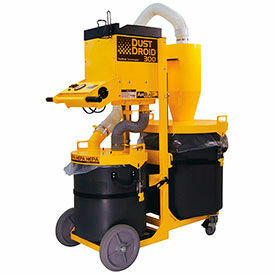 Dustless DustDroid Dust Extractors Are Safe For Silica, Lead Paint, And Hexavalent Chromium Removal And Containment. DustDroid models feature certified HEPA filters rated at 99.97% containment at 0.3 microns. Safe for silica, asbestos, lead paint, and hexavalent chromium removal and containment. OSHA Silica Rule and EPA RRP compliant. Large capacity with two onboard drums for containment. Heavy duty frame made from 1/8" steel tubing, 16 gauge steel and non-marking rubber casters. Solenoid-free Silica Rule-compliant filter cleaning for reliable performance and less maintenance.